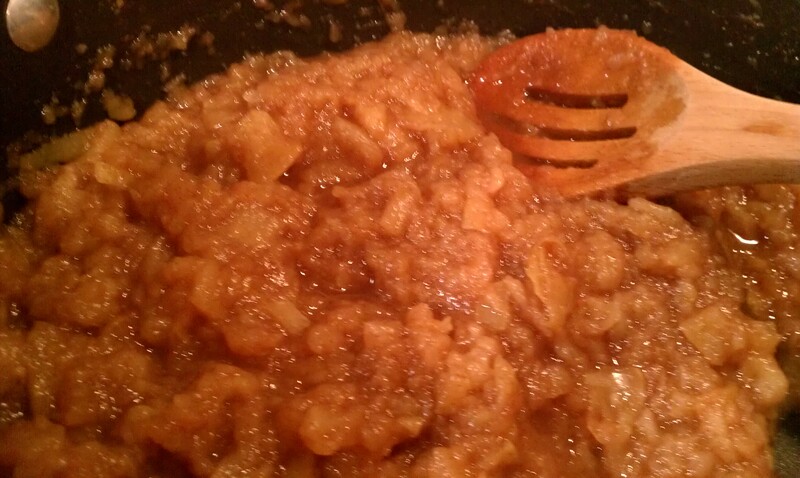 Making applesauce… it’s really easy! This time of year always makes me long for fall in northern Ohio, the land of apple orchards. OK, maybe not THE land of apple orchards, but A land of apple orchards which is more than I can say about central Texas. I think to myself, surely good, cheap apples will show up in the grocery stores in the fall, but they never really do. That doesn’t keep me from making up a few batches of applesauce though! 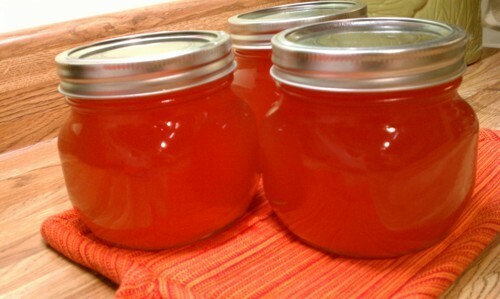 I’ve never canned my applesauce, I just make enough to refrigerate and eat in a week or two. Typically I use around 5 – 7 apples, but if you are feeding more people you can use more. I always start with a sweet variety of apples (often Fuji or Gala because they are easy to find here), mostly because I don’t like tart apples. If you start with sweet apples, you don’t have to add much sugar at all. And you can snack on bits of them as you’re cutting them up. After washing my apples, I start with a handy-dandy apple corer / slicer / peeler contraption from Williams Sonoma given to me by my mother-in-law. I love everything about this tool except having to clean it when I’m done. It’s made out of metal and is very solid and it suctions to the countertop. You can choose not to peel the apples if you don’t want to. 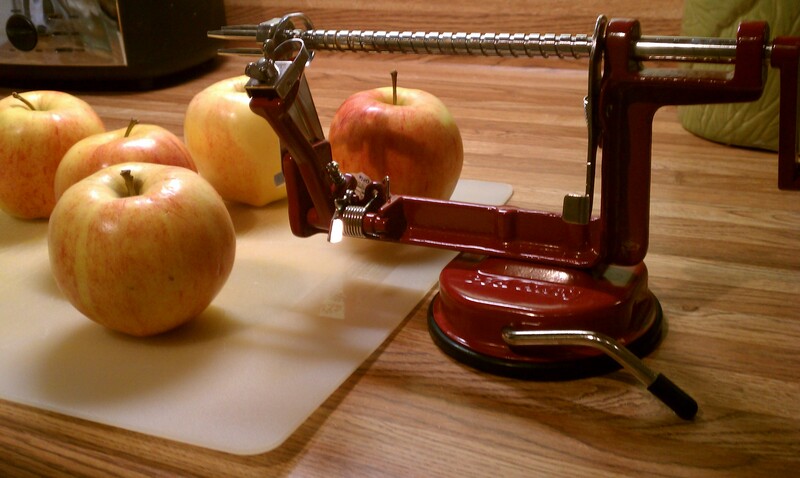 The most awesome tool for coring and slicing apples. 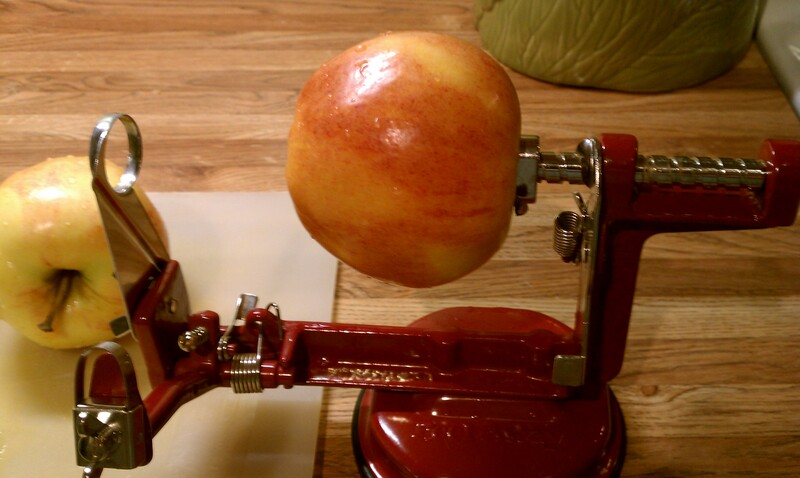 The apple is loaded onto the corer. 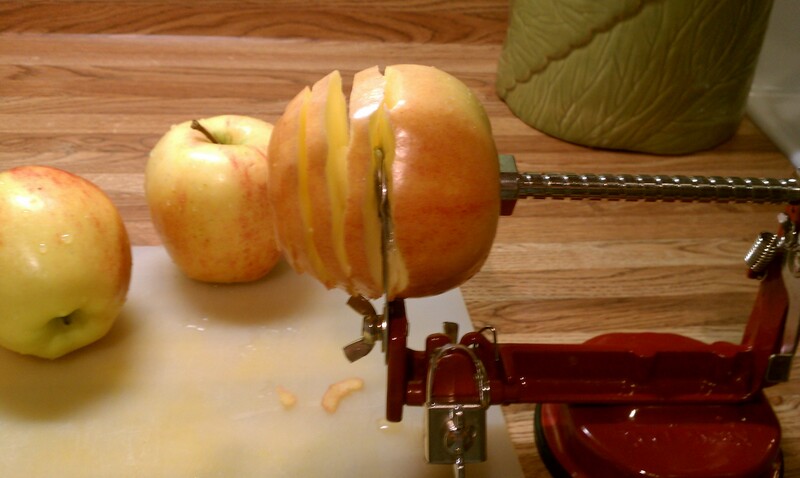 Turn the crank to slice the apple. 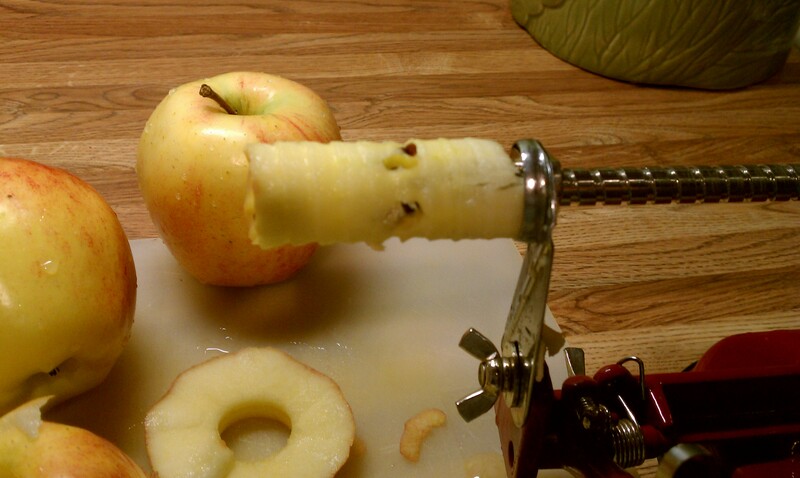 And then you're left with the core mounted on the corer and nice round slices of apple to use. I like my applesauce with the skins in it, but I find if I leave the skins on all of the apples, it’s a little overkill. Instead, I typically leave the skins on about half or a little more than half of the apples and peel the rest. I hand out bits of apple that don’t get used to my dog, she likes apples as much as I do. 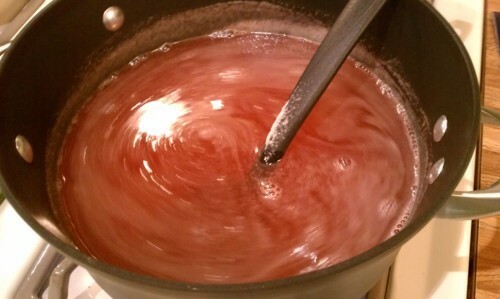 Next up is putting the apples in a pot with some water. 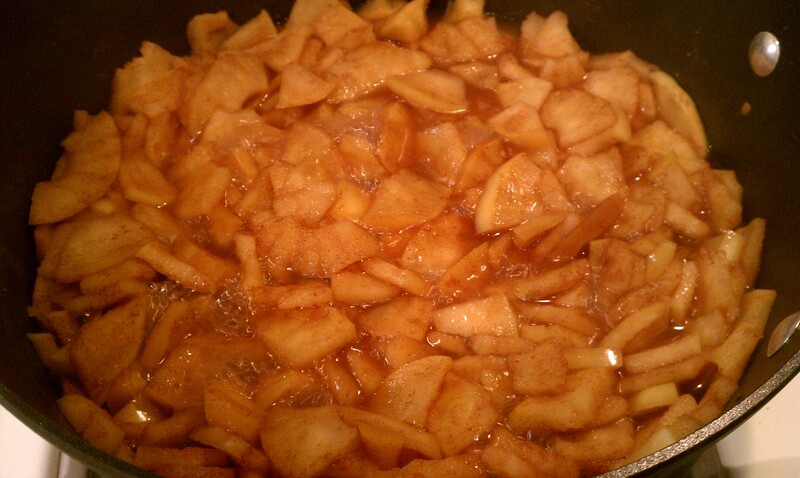 For 5 apples, I start with about one cup of water and add more towards the end if needed. I also add a healthy dose of cinnamon, the best spice ever, and a sprinkling of ginger and brown sugar. Put the heat on medium, cover and let cook. If it starts to boil, turn the heat down to low. It takes probably about 30 – 40 minutes to fully cook the apples. 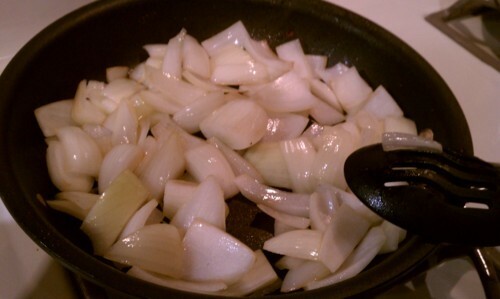 Once they are soft enough, mash them up with a utensil in the pot. I use a wooden spoon or plastic potato masher. 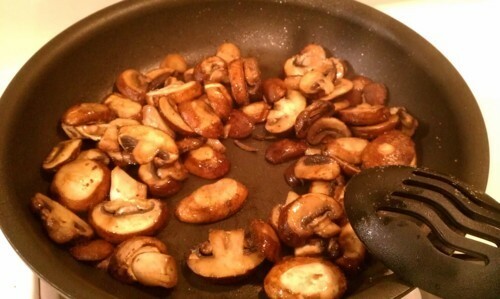 Check the consistency and add more water and cook longer if needed. Taste test and add more spice or sugar. Go light on the sugar though, because not much is needed at all. Last – eat some warm, refrigerate the rest and enjoy the rest of the week! At some point I realized that Alamo Drafthouse, the awesomest of movie theaters, included a dish on their menu called “spaghetti squash and pomodoro sauce”. Since the dish was both vegetarian and featured a new to me squash I had to try it. I think I’ve now eaten it on 3 out of my last 4 Alamo trips because it is delicious. It’s basically squash topped with mushrooms, sauce and parmesan. 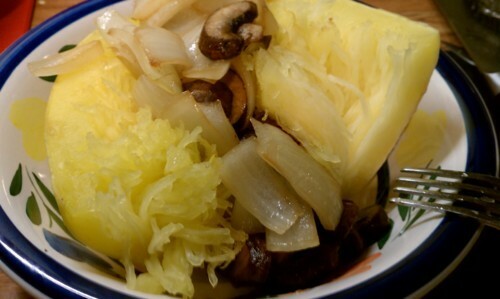 Well this week I decided I wanted to make my own spaghetti squash dish, so I did. 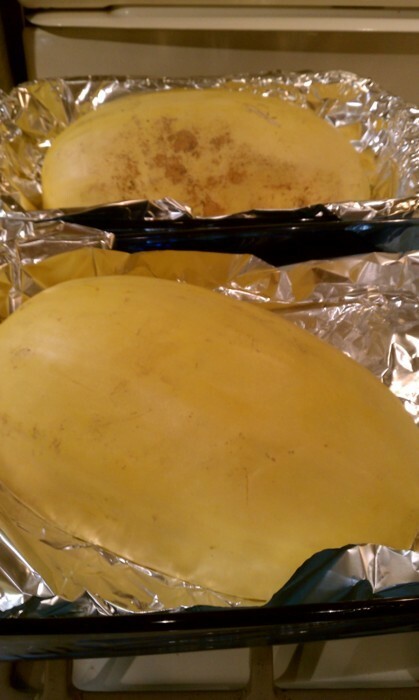 I got a giant squash at the grocery store that fed two of us for two nights. I sliced it open and cleaned it out, kind of like a pumpkin. It then had to go into two separate baking dishes – I baked it for about 50 minutes, sliced side down, with a bit of water in the bottom of the pan. 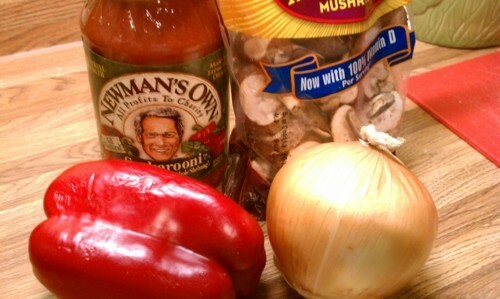 While the squash baked, I assembled my ingredients, sauce, mushrooms, onion, and a red pepper. If you’ve never tried Newman’s Own “Sockarooni” sauce, I highly recommend it. It has a slight fresh garden and spicy flavor and is just plain good. Newman’s Own also donates their profits to charity so that makes me happy. 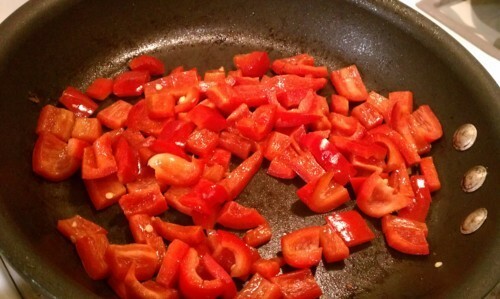 I sautéed each vegetable separately in a touch of olive oil, being careful not to over cook them. After all of that, the squash was about done. I could tell because when I scraped the inside with a fork, the squash easily pulled apart into spaghetti looking strands. I served a quarter of the squash topped with the mushrooms, onion, red pepper, sauce and cheese. It was quite delicious. 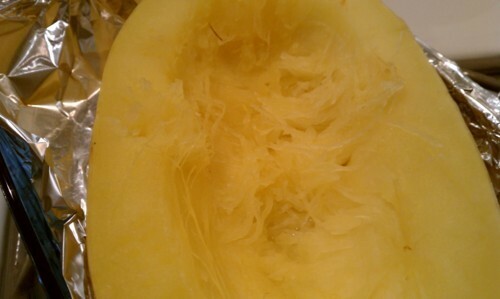 I really like the slightly crunch texture of the squash strands. My first canning results in watermelon jelly! So you may have gathered from my previous post that this week we ordered some local produce from Greenling, a grocery delivery service here in Austin. We ordered from Greenling so that I could get a local watermelon because I LOVE watermelon. Especially juicy ripe watermelon which is what I figured I would get from Greenling. Unfortunately, my watermelon turned out to be light pink when I cut it open and seems to be no where near ripe 😦 Sad for me, big time. 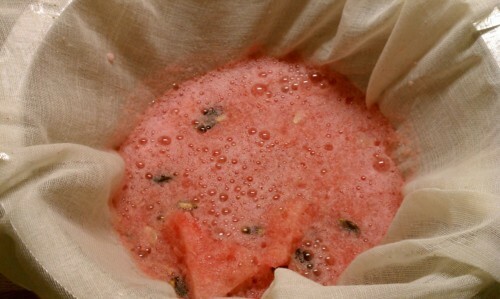 I used about half the watermelon making watermelon jelly, a recipe I saw on the Greenling blog. Hopefully it turns out tasty with underripe melon. I got all my supplies for canning and started the process. While that drained, I went about the process of sterilizing the jars. This was my first canning experience and I think an extra pair of hands would have been handy. First the jars, lid, and rings were washed in hot soapy water. Next, the jars went into a pot of boiling water, the rings into a separate pot, and the lids into a bowl and had boiling water poured over them. After the jars were done boiling, they went into the oven set to 200 degrees so that they stayed clean. The next part was the messy part. 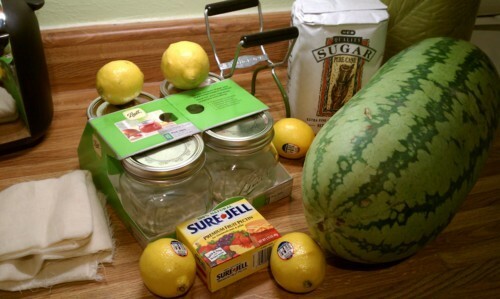 I had to ladle the watermelon mixture into the clean jars. It was not pretty. The instructions said to wipe off the jar threads and rim which made sense as I spilled the mixture all over them. Putting the hot rings on the hot jars was also an adventure. I just hope the jelly wasn’t contaminated. 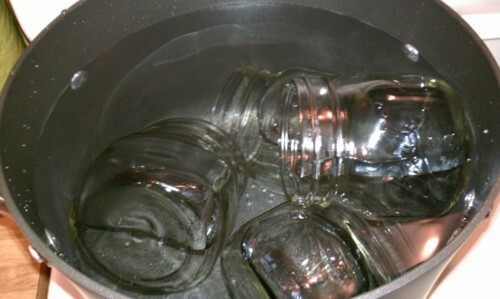 After the jars were assembled, I placed them in the boiling water to process for 5 minutes. Luckily my husband had a set of jar tongs specially designed for canning, so I used them to remove the jars when they were done. I ended up with 3 pint jars, all properly sealed. Let’s hope the jelly is good! 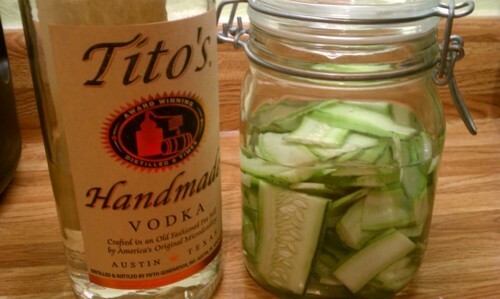 Infusing more vodka…with armenian cucumbers! 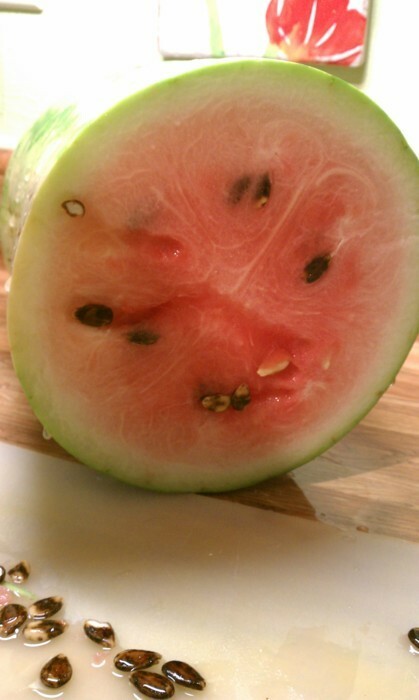 When I learned that local food delivery company Greenling had local watermelons available, I knew I had to have one. However, to get one of those beauties I had to order $25 worth of food. There was plenty of local produce to select from and I ended up with some armenian cucumbers. 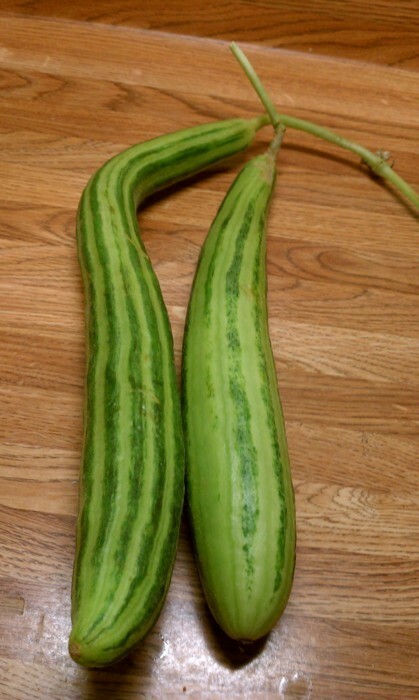 I remembered seeing this Kitchen Konfidence post about using armenian cucumbers to infuse vodka. 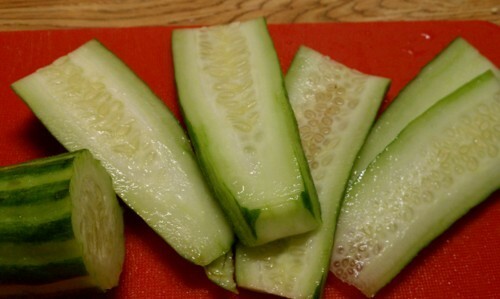 I love cucumbers! I bet I will also love these Cucumber Lime Basil Martinis.